At last I’ve completed the recording and mixing of my album of guitar instrumentals Atlantic Canticles. It has 18 tracks, about 53 minutes of music. In part it is an exploration of altered tunings which I have often used in songs and were the topic of my book How To Write Songs In Altered Guitar Tunings which came out a couple of years ago. None of the tracks are in standard tuning. Many have additional instruments such as strings rather than being entirely solo guitar. I hope the album will be available for purchase online in a couple of weeks – however long it takes for the uploading / clearance process. There will be a separate page on the website which will have more info, including a set of short comments on the tracks. They’re free download mp3s. I hope you enjoy them. The album will be available as mp3 and lossless. ‘Eleanor of Acquifer’ is a sort of companion piece to one of the tracks on the album, ‘Eleanor of Acetylene’. ‘Upon The Printless Sands’ is a variation on another album track ‘Mr Peggotty’s Rag’. For any guitarists reading this I should say that it provides an example of how to get a different slant on a piece by making a small adjustment to the tuning. ‘Mr Peggotty’s Rag’ is in an open tuning in which I left a blue note – a b6 – which then contributed to the ragtime sound by being an open string that could ring dissonantly through the progression. To create ‘Upon The Printless Sands’ I tuned this one note up a semitone to the ‘normal’ sixth. This changed many of the chords from bluesy sevenths into smoother major sevenths. I then slowed the tempo to make it more relaxed and re-wrote several short sections. 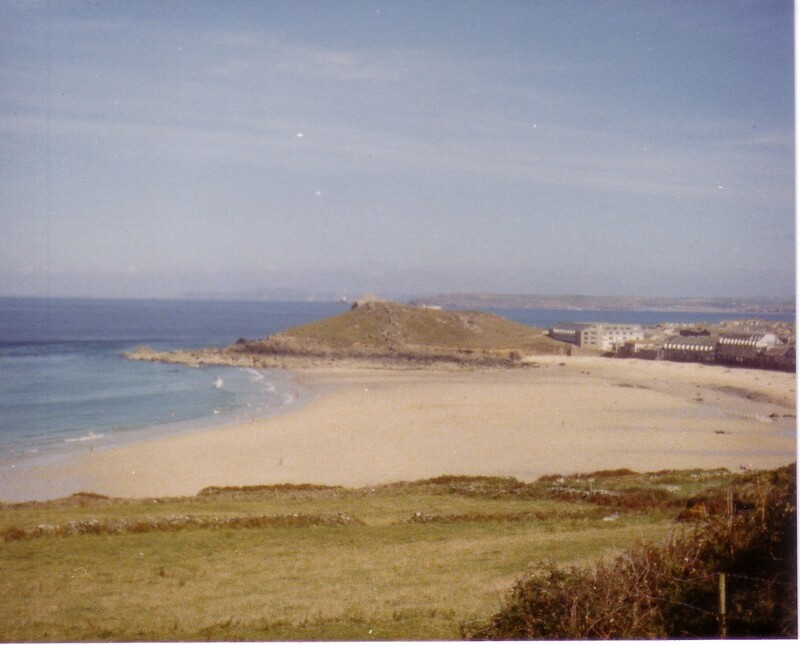 The title is an allusion to a famous speech by Prospero in The Tempest fused with memories of the beautiful beach of Porthmeor at St Ives in Cornwall pictured above. This entry was posted on February 27, 2013 by rikkyrooksby. It was filed under Uncategorized and was tagged with Atlantic Canticles, Eleanor of Acquifer, guitar instrumental, Upon The Printless Sands. I have been reading your book on altered tunings with great interest. I have some sheet music from Led Zep and note that the tuning for The Rain Song uses Gsus4. This tuning does not appear in your book and I am having trouble de-coding the tuning, i.e. working out which type of tuning it fits into so I can compare it to other songs. The tuning is D, G, C, G, C, D (top E string). I assume this is a Gsus4 chord. Does it compare to other sus4 altered tunings? Can I use similar chord shapes when in this tuning to other sus4 shapes? It appears closest to Csus2 in Section 9 of the book on pg 111. Hello Allan, sorry for the delay in replying – I’ve been busy promoting my Atlantic Canticles guitar album, all of which is in altered tunings. I’m not sure that there is another tuning in the book that The Rain Song compares with. It is sufficiently odd as a tuning that I deliberately left it out in terms of giving chord shapes. It could be described as a sus4 tuning but I feel this may not be so helpful if there are two ‘4’s in the open strings. This one is 5 1 4 1 4 5 with G as the root note. Usually on the guitar a suspended fourth is not doubled. If DADGAD or DGDGCD are considered Dsus4 and Gsus4 tunings respectively note that they each only have one 4th. Page’s tuning could be seen as a derivation from either open G, Gsus4 or open C or open Csus2 (CGCGCD). If you are concerned with finding chord shapes the important factor is the intervals between the strings which in this case is 55752. I had a quick look to see if I could see another tuning that contains those intervals and I couldn’t. I would use the chord shapes you know and then tweak them as necessary – a case of using your ear to guide you rather than theory. I hope this helps. Thanks for your interest in the altered tunings book.